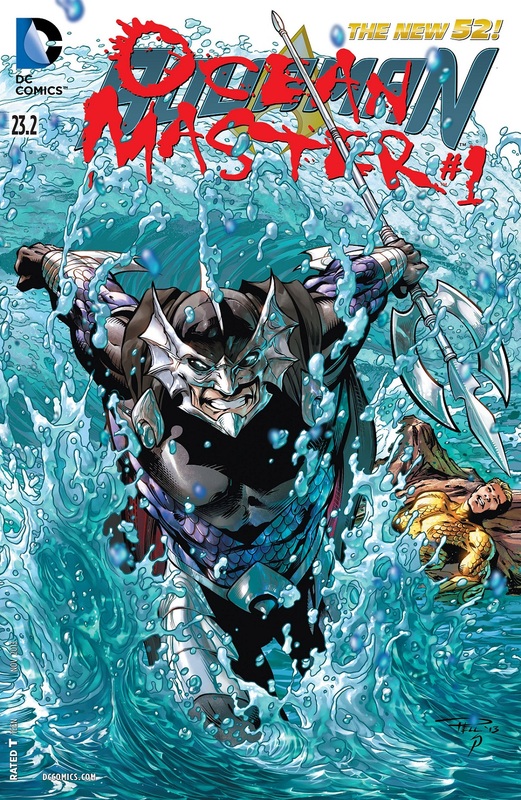 In many ways, Ocean Master makes the perfect opposite to Aquaman. There are the obvious dissimilarities of course, such as the fact that Ocean Master is a full-blooded Atlantean, that he is fully devoted to his heritage, and that his people actually do respect him through and through. Then there are the subtler things, such as the fact that he is a reluctant King. He considers it to be his duty and he wants to be worthy of that duty. He empathizes with Aquaman but also is willing to accept the hard truth that the ocean world and the surface world are just too dissimilar to ever get along, something that Aquaman doesn’t accept and is a problem that he tries again and again to overcome. With all of this, going into this issue, I wanted a story that would be character-heavy. The plot of Forever Evil is largely already known, at least for this month’s issues, given that this was the final release week. And that is pretty much what I got. Overall, it is a much stronger issue than the previous one, also written by Geoff and Tony, for the precise reason that it doesn’t seek to tie-in directly to Forever Evil #1, but that instead it progresses Ocean Master’s own story. We see him from the days of the Throne of Atlantis crossover to right now, when he is held in Belle Reeve as a war-criminal and then the Crime Syndicate breaks out all the supervillains from their prisons all over the world. We see defining moments in Ocean Master’s life as the King of Atlantis, we see glimpses of what made him the Atlantean that he is today. And its all quite stirring stuff. Not a lot actually happens here since the story is focused on a very specific moment in Orm’s life, but I was largely fine with that. I’d have liked to see how and when he returns to Atlantis, but it is what it is. And, to a degree, this is where the issue takes a downturn. In the previous issues of Aquaman we’ve seen that one of Orm’s loyal soldiers coerces his sister and an outcast Atlantean to sneak away to Belle Reeve to rescue Orm. It was a fairly important subplot in the series, currently in the Death of a King arc, and that all fizzles out here. None of these three characters are mentioned here, no hints as to their whereabouts or anything else. It created a huge disconnect for me. Were they killed by all the escaping supervillains? Were they killed by the Crime Syndicate perhaps? In Forever Evil #1 we saw that the Earth 3 Aquaman, known as Sea-King IIRC, dies as soon as the Crime Syndicate teleports to Earth Prime from Earth 3. The way that panel is set up, it looks like he is shot in the back but that’s conjecture without any hard evidence. It raises some interesting questions about how the Crime Syndicate presents to take care of Atlantis and I was hoping that this issue might address that concern. But it doesn’t. Not really sure what to make of it all. The art in this issue is provided by penciller Geraldo Borges, inker Ruy Jose, colourist Rod Reis and letterer Travis Lanham. For the most part, I really enjoyed the art here. There are some really incredible panels and splash pages in the issue. Lots of variety in character expressions and body language and the art matches up really well with the script. There are two reasons for why the art here stands out. First, Geraldo’s style is very similar to that of Paul Pelletier, who is the penciller on Aquaman main series. And Rod Reis is currently doing the colours for the same. That creates a really nice bit of consistency and overall it gives us a solid piece of art. Its not the best, since there are some internal inconsistencies with how Orm is drawn and some of the characters have faces that are too shaded/inked, but the overall effort is still among the best that Villain’s Month has given us. As a one-shot package, this is a good issue. Some really nice characterisation of Orm and some backstory on him as well. To use a common parlance, this is a 75% show, 25% tell kind of story, and it largely works. More Aquaman: #0-12, #13-15, #16-21, #22-23, #23.1. Posted on September 26, 2013, in Comics Reviews, Review Central and tagged Aquaman, Atlantis, Comics, Comics Reviews, DC Comics, Geoff Johns, Geraldo Borges, New 52, Ocean Master, Orm, Review Central, Rod Reis, Ruy Jose, Tony Bedard, Travis Lanham, Villain's Month. Bookmark the permalink. 14 Comments.